Above: Tiny Team dancers from Danz Kraze studio perform Sunday during the 15th annual Kids Expo at the YMCA Sports Center, 3456 Craig Road. Hundreds of families enjoyed an afternoon of entertainment and play at the expo billed as the "biggest children's event in western Wisconsin." View more photos at LeaderTelegramPhotos.com. Right: Curt Moss, left, of the town of Seymour and Joe Grace of Independence race for possession of the remote control during a "Daddy Crawl" competition Sunday during the 15th annual Kids Expo at the YMCA Sports Center. Curt Moss, left, of the town of Seymour and Joe Grace of Independence race for possession of the remote control during a "Daddy Crawl" competition Sunday during the 15th annual Kids Expo at the YMCA Sports Center. Above: Tiny Team dancers from Danz Kraze studio perform Sunday during the 15th annual Kids Expo at the YMCA Sports Center, 3456 Craig Road. Hundreds of families enjoyed an afternoon of entertainment and play at the expo billed as the “biggest children’s event in western Wisconsin.” View more photos at LeaderTelegramPhotos.com. Right: Curt Moss, left, of the town of Seymour and Joe Grace of Independence race for possession of the remote control during a “Daddy Crawl” competition Sunday during the 15th annual Kids Expo at the YMCA Sports Center. 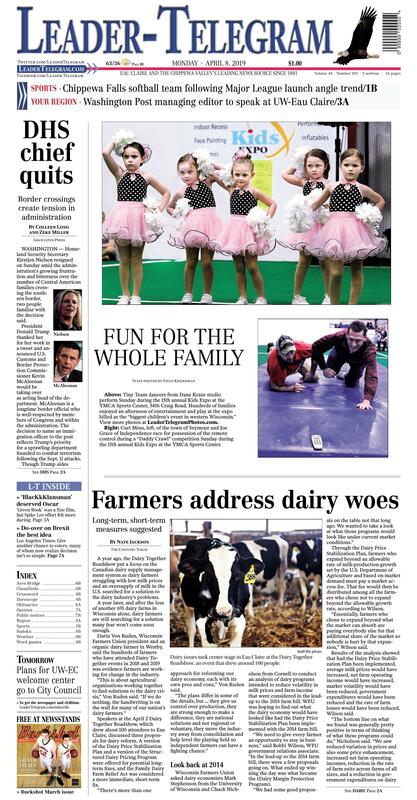 Dairy issues took center stage in Eau Claire at the Dairy Together Roadshow, an event that drew around 100 people. A year ago, the Dairy Together Roadshow put a focus on the Canadian dairy supply management system as dairy farmers struggling with low milk prices and an oversupply of milk in the U.S. searched for a solution to the dairy industry’s problems. Speakers at the April 2 Dairy Together Roadshow, which drew about 100 attendees to Eau Claire, discussed three proposals for dairy reform. A version of the Dairy Price Stabilization Plan and a version of the Structured Dairy Pricing Program were offered for potential long-term fixes, and the Family Dairy Farm Relief Act was considered a more immediate, short-term fix. “We need to give every farmer an opportunity to stay in business,” said Bobbi Wilson, WFU government relations associate. “In the lead-up to the 2014 farm bill, there were a few proposals going on. What ended up winning the day was what became the (Dairy Margin Protection Program). Bylsma said milk production has outpaced demand, all while the number of farms in the U.S. has declined by 94 percent since the 1970s, a trend he said is expected to continue, with the USDA projecting fewer than 18,000 dairy farms remaining in the U.S. in 2036. The program would be voluntary and would draw from USDA funds, according to the NFO. “America’s dairy farmers strongly prefer market solutions, but in times of crisis must also recognize the importance of short-term federal intervention,” the group said. For more information about the proposals, visit dairytogether.com. Then-Department of Homeland Security Secretary Kirstjen Nielsen, left, speaks with Border Patrol agents near a newly fortified border wall structure Oct. 26 in Calexico, Calif. In a tweet on Sunday, President Donald Trump said he's accepted Nielsen's resignation.